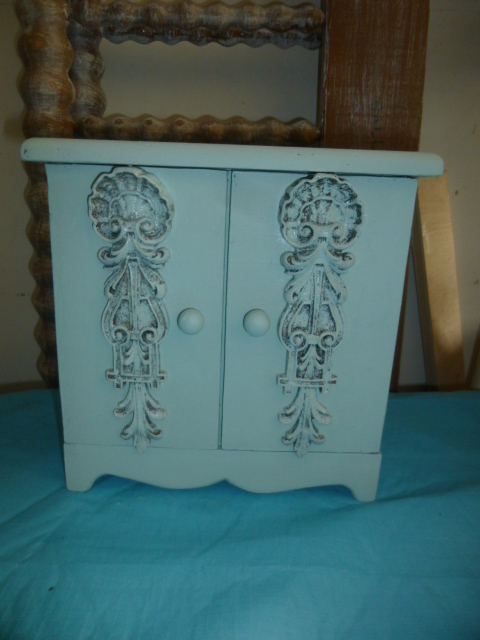 Remember this cute little grey chest of drawers? 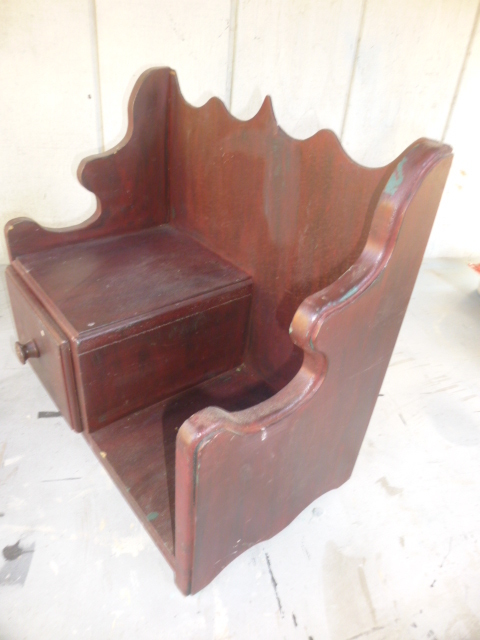 It’s been forever since I had any chests to put in my booth at Stars, so I was anxious to get this one painted and taken in. 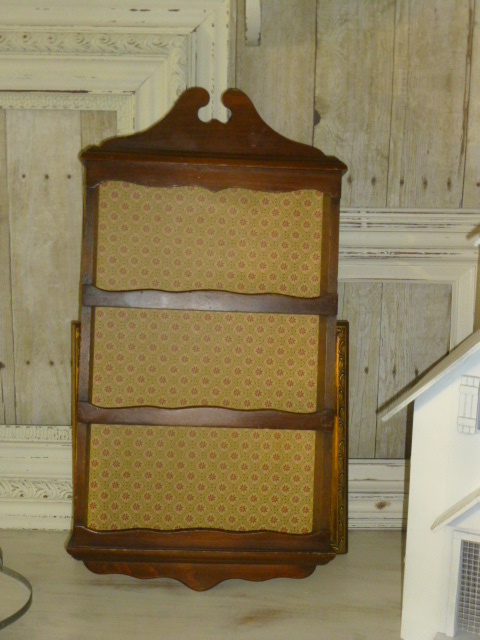 Just DAYS after I had put it in my booth, I came across this adorable little SOLID OAK hutch top / cubby shelf, that looked like it would be a perfect fit to set atop the grey dresser. I went to work on it as fast as I could. Painting it in the same grey that I had used for the chest, and distressing it. I was SO looking forward to pairing it with that grey chest! 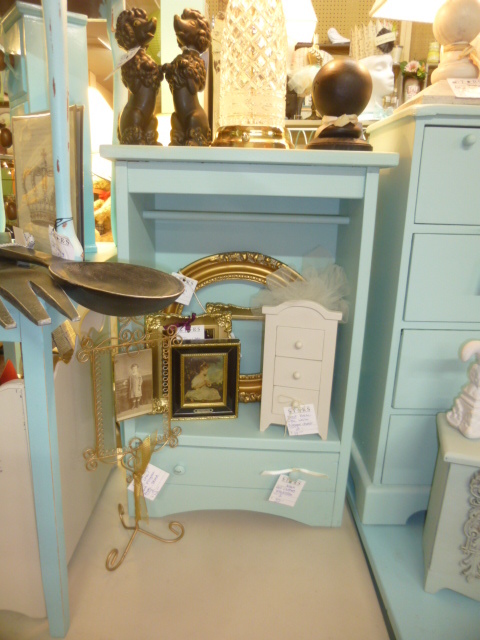 Alas, when I went in the following week with the grey hutch top and some additional stock for my booths, the chest had SOLD!! Bitter sweet. Happy for the sale, of course; but disappointed that I wasn’t able to display the two pieces together. Lousy timing! 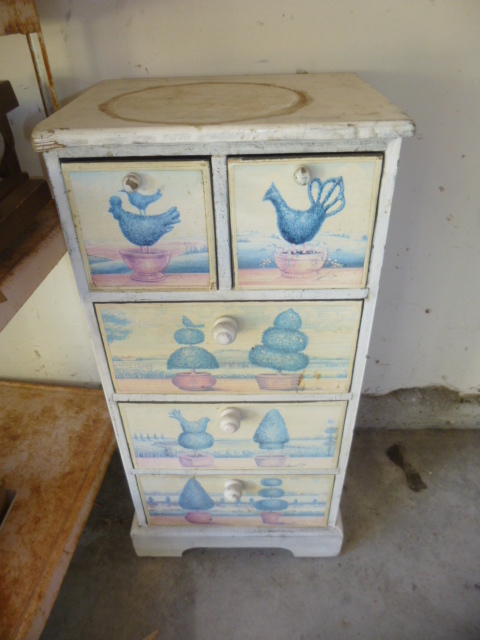 Off white oval three tiered night stand; painted pink and distressed. This piece is available for purchase at Pink Door in Aurora, Oregon. I had two of these child size chairs. The seats were made of that white ‘dry erase board’ kind of wood, which as as you can see in the before photo, was slightly damaged. While the damage did not affect the structural integrity of the chairs; my attempts to cosmetically repair them failed. Pretty wrapping paper and Mod Podge to the rescue! These have not yet been taken to either of my sales venues. 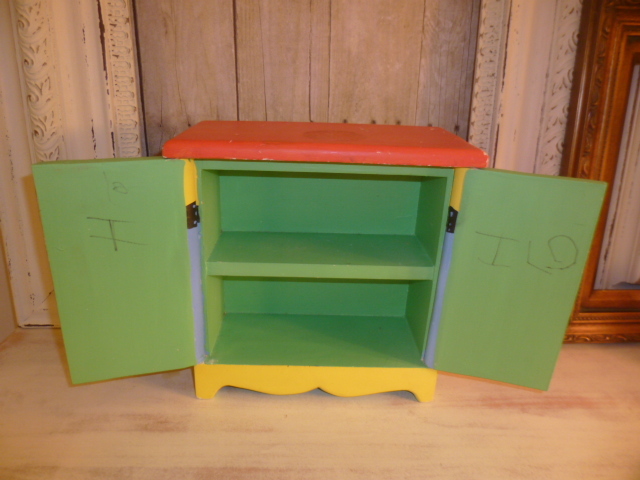 The drawers to this cubby didn’t slide very well once I had re-painted it; so I set them aside for some other project. Cubbies with the backing already on them are extremely time consuming to paint; hence, spray paint is my go to solution for such pieces. A little hand sanding along the edges shabby it up a bit. available to purchase in my booth at Stars. Continuing with the grey color scheme on this small shelf and DVD rack. available to purchase in my booth at Stars. This bar stool is BIG and sturdy. It had a glossy finish on it to begin with, so I had to either prime it or sand it before re-painting it. 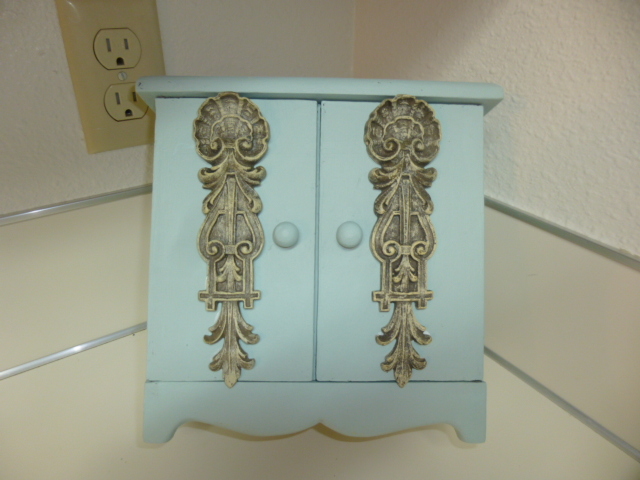 I opted for primer, which gave it an added dimension when I distressed it. 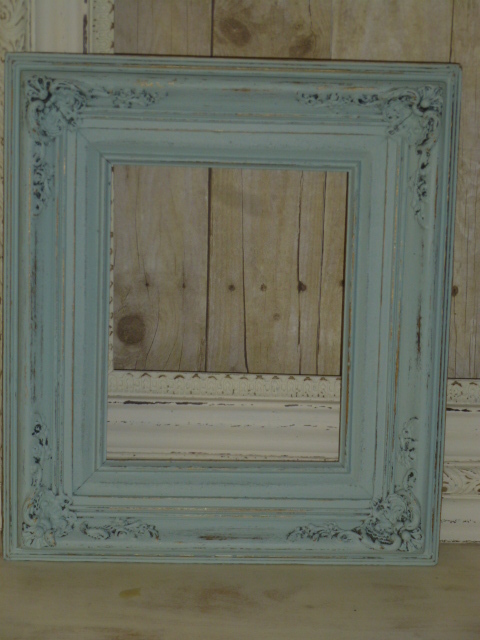 Some of the distressed areas show the white primer layer and others the original dark color. I was very tempted to stencil something on the back, but I couldn’t quite decide what, and I really NEEDED furniture in my space, so I left it plain for now. Available to purchase in my booth at Stars. With two of the wicker drawers missing, I opted to just remove them all. 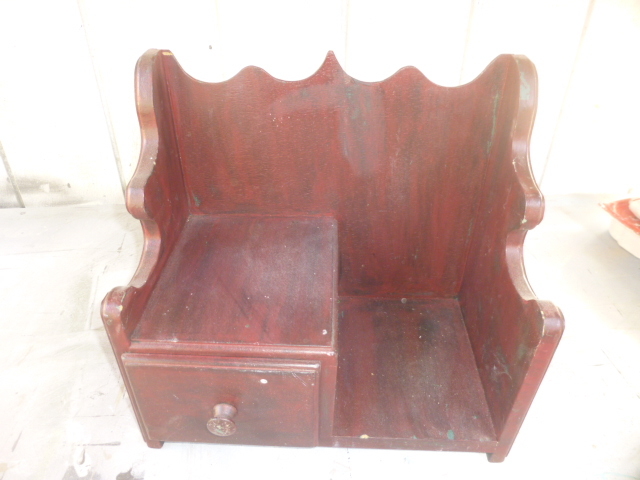 The cubby was in fairly rough shape, and since I had just painted the other cubby white, I decided to leave this one it’s original wood; just distressed it a bit. It’s available to purchase in my booth at Stars. The leopard print mannequin torso needed some ‘legs’. I had a black wrought iron base and a tall curvy plant/candle stand. Opted for the wrought iron base as the weight of it would make her stand steadier; and besides, her skirt pretty much covers the base. I used nearly 100 yards of tulle to hand make her fluffy black skirt. She is available for purchase at Pink Door in Aurora, Oregon. A couple of smaller upcycled mannequins with fluffy tulle skirts; also available for purchase at Pink Door in Aurora, Oregon. I’m ALWAYS on the lookout for vintage gumball machines to make over and fill with ‘fun stuff’ like seashells, spools of thread, jingle bells . . . . etc. NEVER imagined that I’d come across a silver plated one!?!?! It really wasn’t even very tarnished and required minimal polishing. Such a fancy gumball machine needed some fancy filling. Acrylic gemstones to the rescue. They look prettier in person. 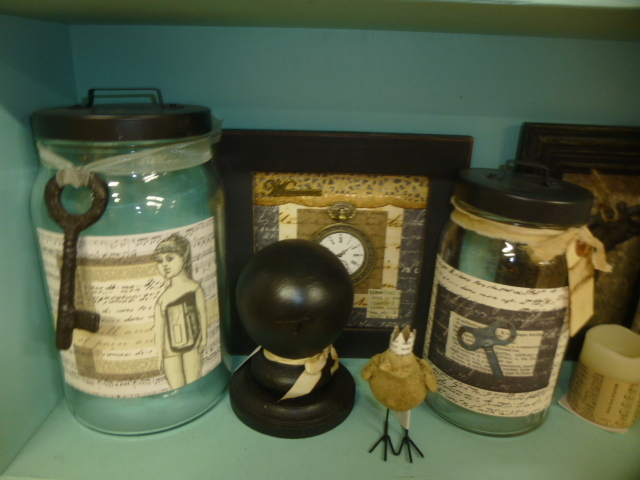 Available for purchase at Pink Door in Aurora, Oregon. Somehow I missed getting a ‘before’ picture of this one. 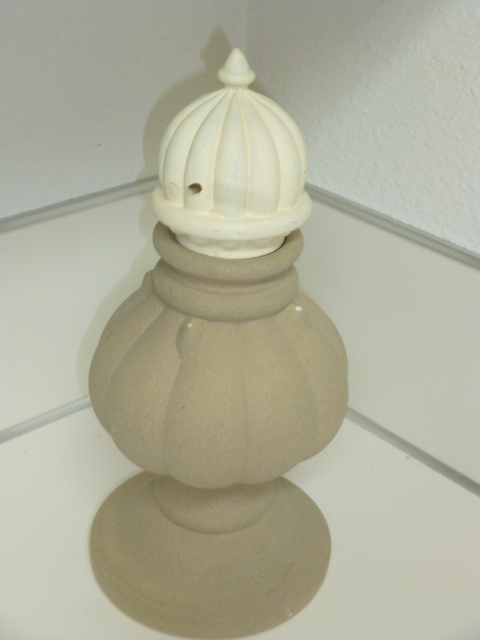 It was dark brown wood, that I sanded painted and sanded again to distress. 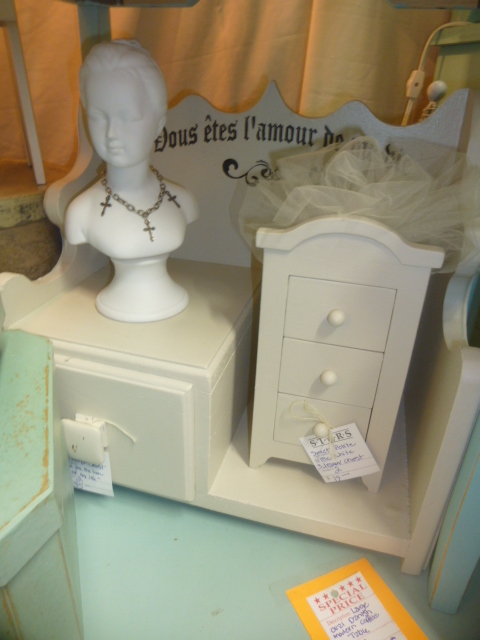 LOVE the little drawer and the ceramic rose drawer pull that I put on it. This piece can be purchased at Stars in Portland. Could hardly believe my good luck when I found this set of three suitcases . . . ALL of them had beautifully CLEAN innards!! The color is difficult to tell in the photos, but it’s a very, very pale pink. 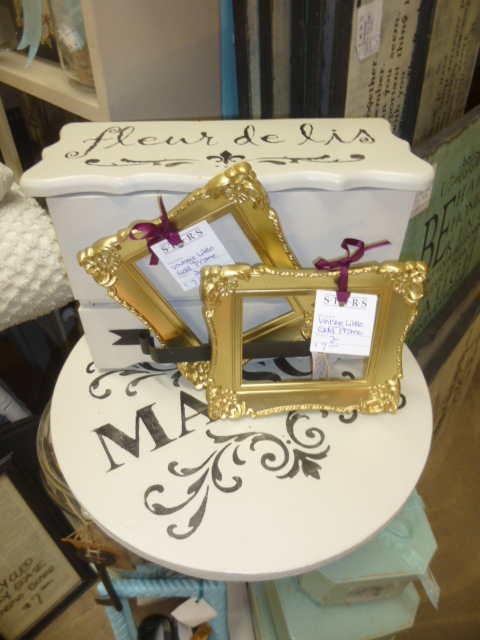 Each is priced individually; and available for purchase at Pink Door in Aurora, Oregon. Just waiting for the weather to cool down a bit and the outside air to be ‘breathable’ so I can get LOTS more painting done. Just a quick reminder before writing this post, the BIG sale at Stars continues through Monday, July 18th. Stars is open 7 days a week; 11am – 6pm. 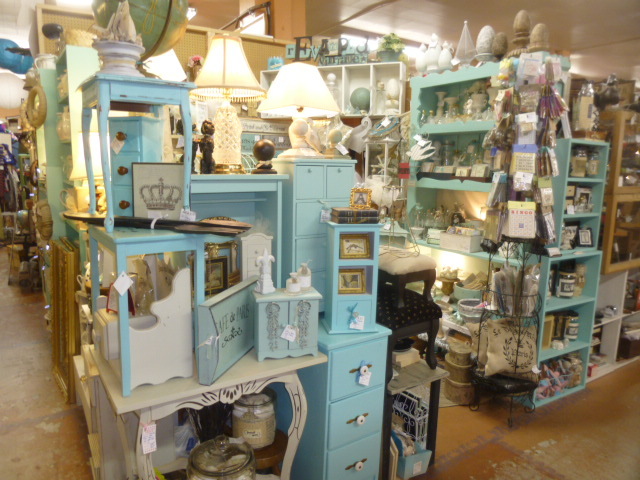 Sale % varies per vendor, from 10% to 50%; as indicated by signs in each booth. Prices shown on items are the ‘regular price’. Discount is given at check out! AS ALWAYS, EVERYTHING IN MY BOOTH IS 50% OFF DURING THE SALE! And now, on to today’s post! Found this little tray at a thrift store. The tray itself was nothing special; and actually almost too small to be very functional. But those big wrought iron HANDLES are fabulous! The price of the tray was well worth it just for the handles! I took the handles off when I brought it home; painted the tray aqua, then just set the tray aside due to lack of inspiration for what to do next. 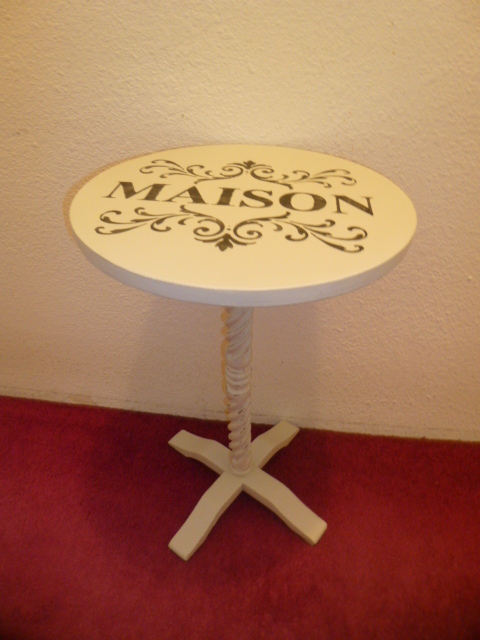 I found this shabby white wood tray more recently. Love the handles on this one too, but decided to leave them in place. Considered selling it ‘as found’ . . . but then. . . . I decided to add this stencil, and distress it a bit more. 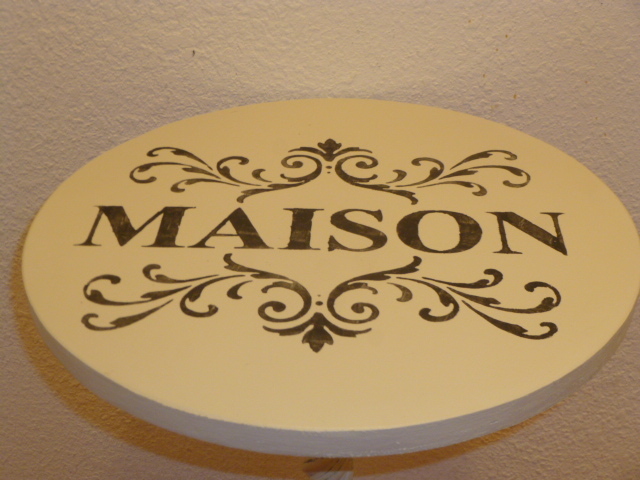 And while I was ‘thinking trays’ I decided to add this Paris stencil to that aforementioned small tray sans the handles. 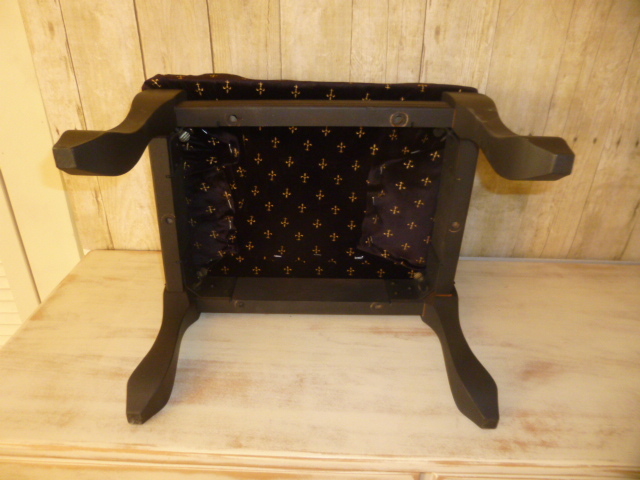 Both trays are available for purchase in my booth at Stars. Now just waiting for that ‘perfect piece’ to use those nice big wrought iron handles on! 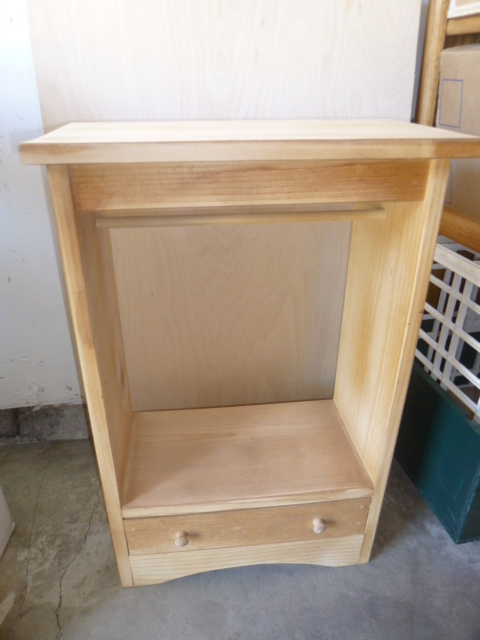 Nice, solid wood end table. End tables with lower shelves are my FAVORITE! This one’s in pretty good shape too. Except for that big ole watermark . . . . um, make that a CRACKED watermark. Can’t really see it in the pictures, but the wood is cracked clear through in the middle of the watermark. 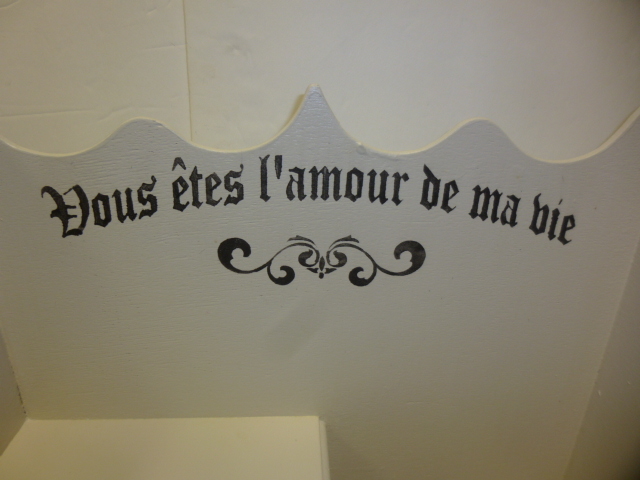 I filled the crack with a bit of wood putty, sanded the top a LOT; tow coats of aqua paint; more sanding; pretty French Script words stenciled on the top and a little MORE sanding to fade and distress the wording. Two good coats of matte varnish and DONE! The legs and lower shelf were still in great shape. so I left them ‘as is’. 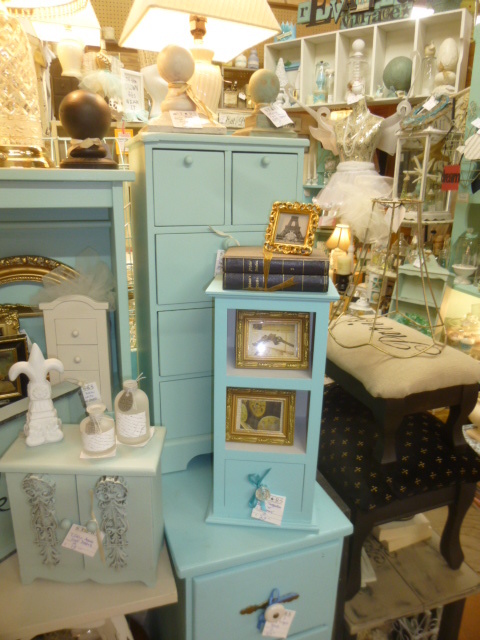 I think that ‘two tone’ type of furniture painting is still in style?!? I still seem to see a lot of it at least. These photos are more ‘true to actual color’ than the previous ones. The other pics were taken outside in the shade and came out a bit dark. 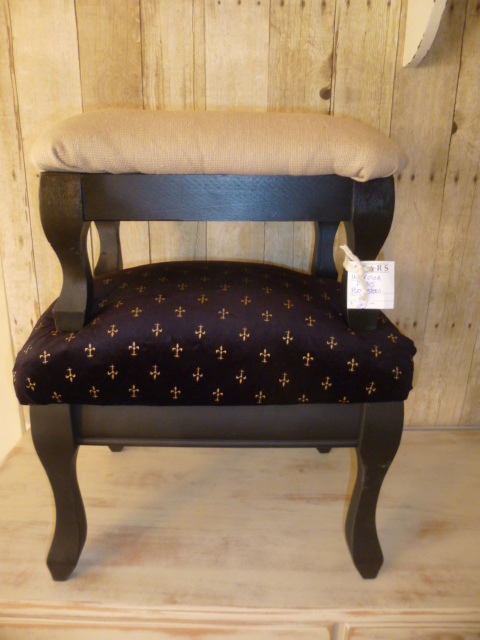 Available for purchase in my booth at Stars; along with LOTS more furniture pieces. I painted this BIG vintage suitcase quite a while ago. I was just learning to stencil, and, as you can see, I did NOT do a very good stenciling job on this suitcase. Between the bad stenciling job and the black paint so easily getting scratched up; I’m not surprised that it didn’t sell. But it’s a really NICE old suitcase; big and with pristine ‘innards’. ( It still has the original key to lock the suitcase!) I decided to hang onto it until I figured out something else to do with it. After ‘over thinking’ about what to do with it for FAR too long; I decided to go with my ‘go to’ color. 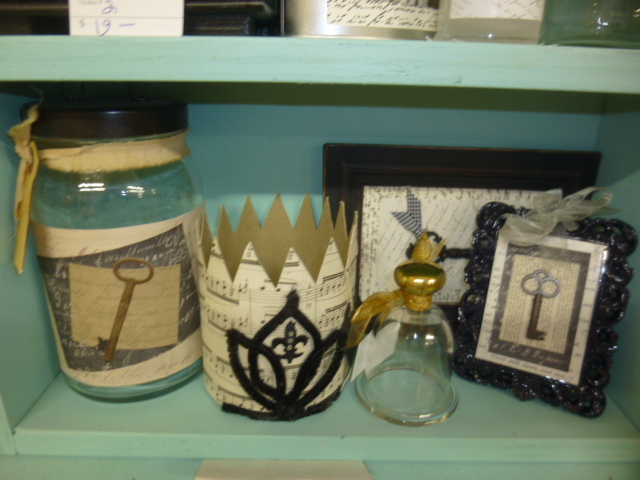 Combined a couple of different stencils to decorate it with, and added a big decorative key, tied on with a tulle bow. It’s available for purchase for $65.00, in my booth at Stars. Little stools are one of those things I’m ALWAYS on the look out for. 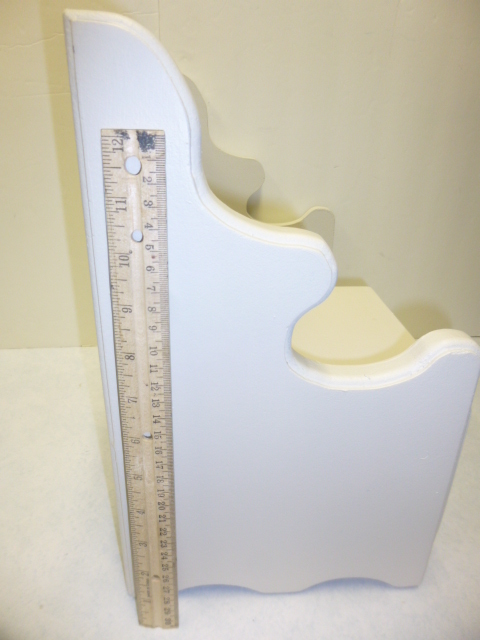 They consistently sell well, AND are really handy for creating height in my booth displays. Found this little oval one a while back. Took a fair amount of sanding to sand down the painted on angel design; but after that it was quick to re-paint. I left the brown base-coat, and gave the top a fresh base of brown before painting the whole thing aqua. Some hand sanding and a stenciled design on top and DONE! Available for purchase in my booth at Stars. Hello, my name is aj; and I’m a ‘soapaholic’. If you are a regular reader of my blog, you’ve probably already figured that out! I must confess that my addiction goes further than that. I can’t resist ‘sniffing soaps’ at the store. No, not the soaps in the soap aisle at the grocery store. The ‘fancy’ soaps that come in pretty boxes. Marshall’s is my favorite store for ‘soap sniffing’. But I don’t sniff just ‘any soap’! No ‘floral’ fragrances for me (except Lavender). Other floral scents make me sneeze! And I only like ‘neutral color’ soaps. I I was attracted to this box of soap because of the pretty box. When I opened it and saw that it was PINK, I quickly put the lid back on and replaced it on the shelf withOUT even smelling it. Because I don’t like pink soaps! Just as I was starting to reach for the next box to open and sniff; the fragrance from that box with pink soap gently wafted by and it was AMAZING! It smelled like a fresh strawberry pie. I could NOT resist a full on sniff. I HAD to buy it! I love upcycling these pretty soap boxes. Usually I have to re-cover the entire box; but this one was already decorated so nicely that I only had to cover the ‘soap’ information. I found some print scrap book paper that coordinated with the paper on the box to cover the front label. Used a piece of the same paper to cover the bottom of the box. There was a removable ‘riser’ in the bottom of the box that I wanted to leave in place because it SMELLED so good; so I added some of the same paper to it. Easy peasey pretty (and fragrant!) little gift box ready to go! My first ‘binge painting’ in my new place is done, and everything is now stocked in my booth at Stars. The three shelf spice rack. 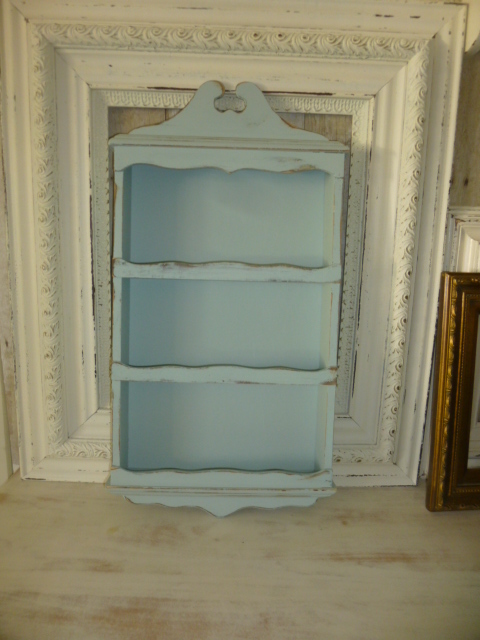 I debated painting a design on the back, but nothing really ‘clicked’, so I painted it the same aqua as the shelf. Lightly hand sanded along the edges to distress. A reminder of how it looked originally. In progress. This is what it looked like after the first coat of paint. You really don’t need ‘perfect’ coverage on the first coat. 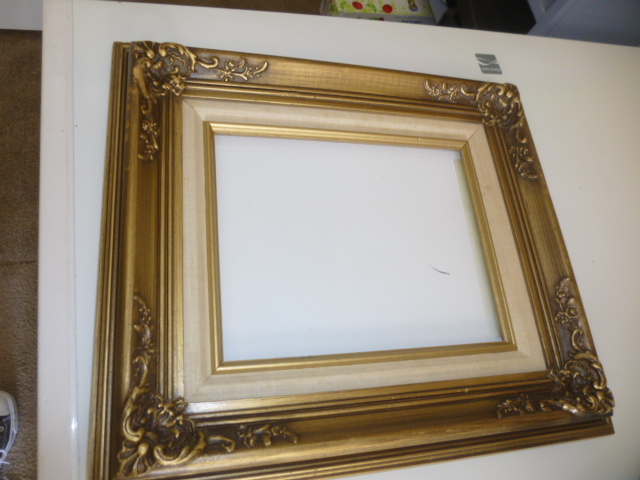 As you can see, I removed the backing; originally because I was going to paint a design on it. But even if I had initially planned to just paint it to match the rest of the shelf, I’d have removed it to make painting easier. 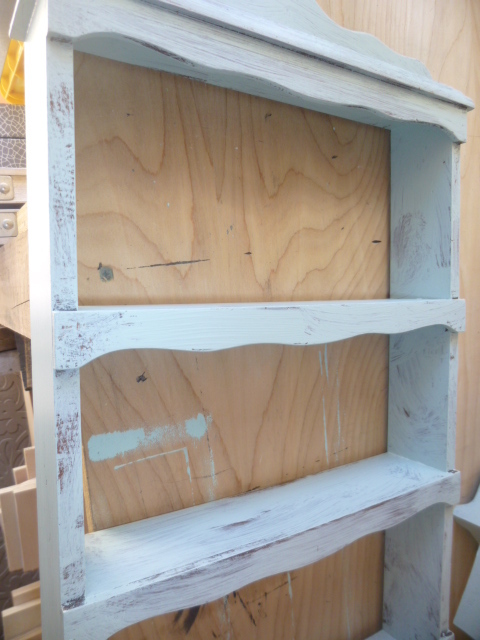 With the back removed you have far LESS little corners to paint and you can reach the shelved from the front and back. And the backing takes about 15 seconds to paint with a roller. SO, even accounting for the time involved in removing and replacing the backing; you have saved time overall. 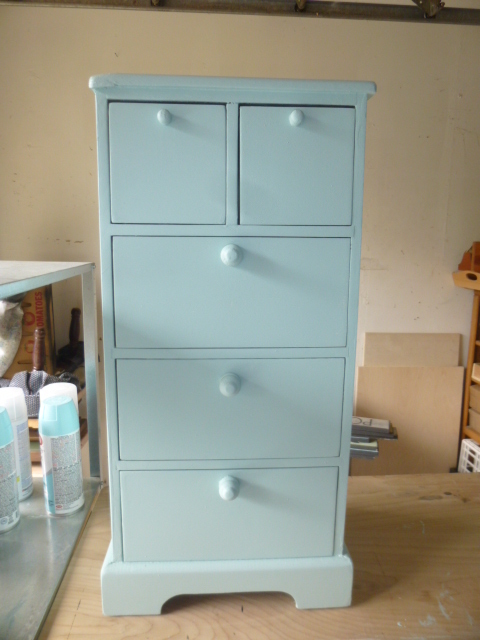 First I spray painted it flat black, then two coats of aqua brushed on. 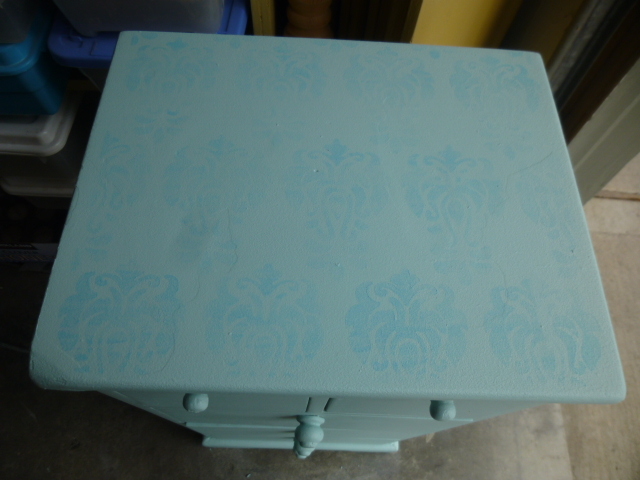 I intentionally avoided getting the aqua paint down into all the carved details for some contrast. Once dry, I hand sanded along the raised edges. 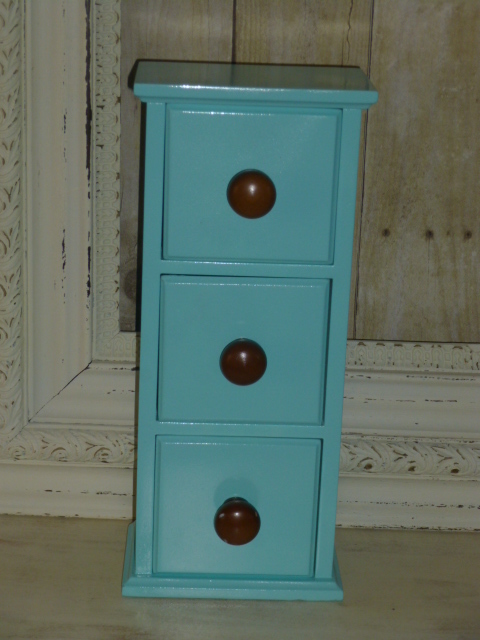 The little 3 drawer jewelry chest. I gave it different knobs . 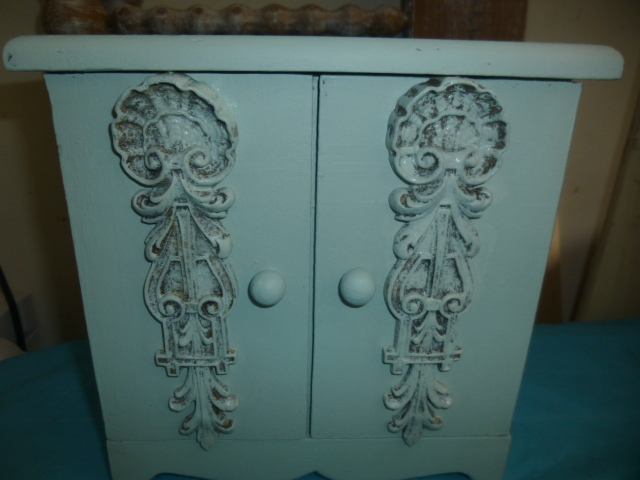 . . thought about painting the knobs to match, but decided not to. If it doesn’t sell like this I can always bring it home and paint them. 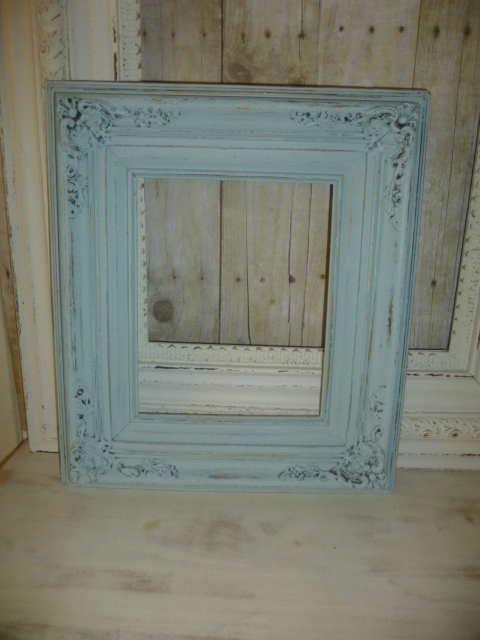 I used a turquoise spray paint on this one. The ‘to paint or not to paint’ conundrum strikes again! It was just TOO plain with nothing on the front. 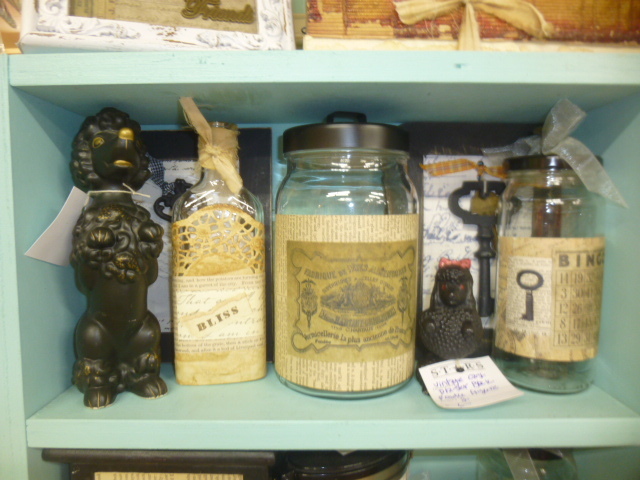 These resin medallions were all I could find that would fit with the non-removable knobs. Added them as an after thought . . .paint them? After walking away from it and coming back later, I decided it was too much contrast o leave them ‘as is’. Opted to dry brush paint them to allow some of the black show through. The inside is fully painted too . . . . This one ‘needs something’ . . . . but I failed to find that something. We’ll see if it sells ‘as is’ and if not I’ll re-address the embellishment conundrum. 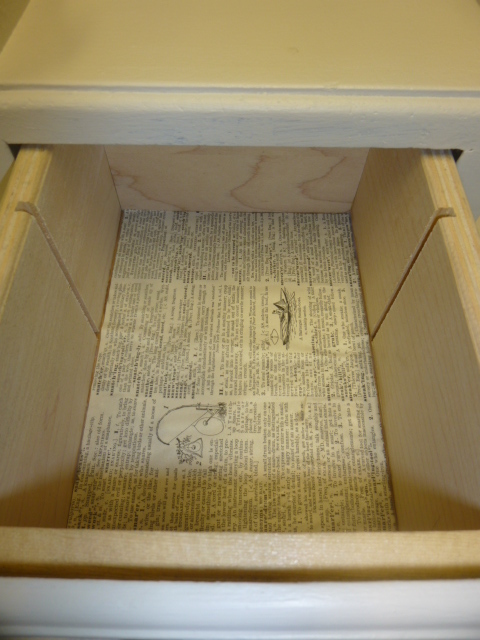 Old dictionary pages glued to the bottom of the muddy brown drawers. The before. 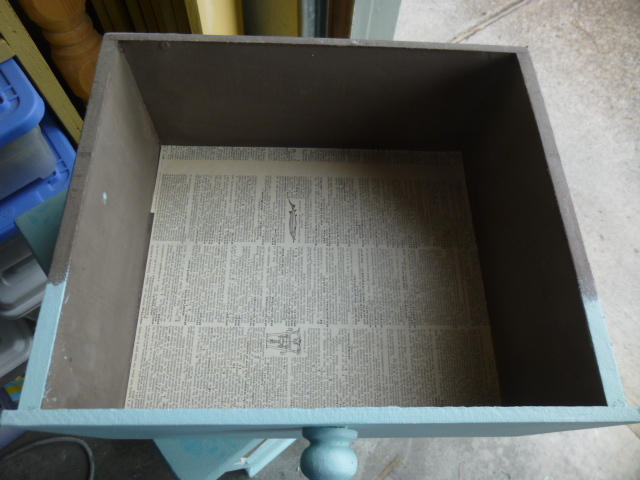 The designs on the front were ‘papered on’, but sanded of pretty easily. The KNOBS were not removable unfortunately. 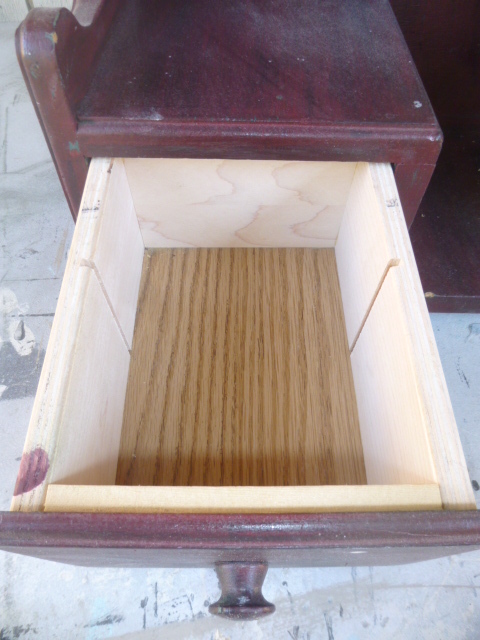 Had they been, I would have filled the holes and added new ones, centered on the drawers. 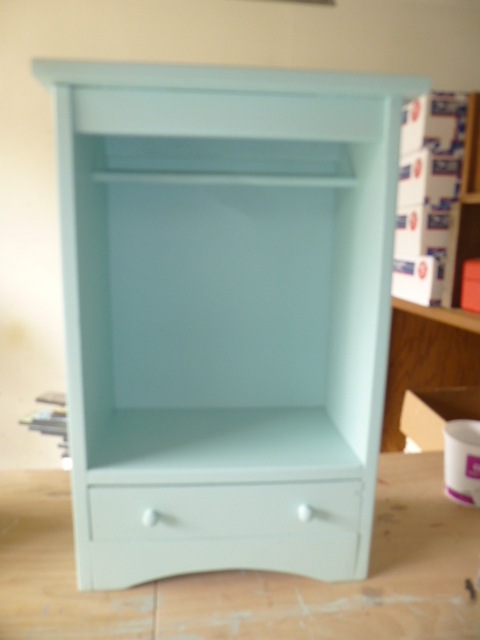 The doll clothes wardrobe; just painted it, no embellishments. Even though it was unfinished wood, it still required some ‘prep work’ before painting. Raw wood will really absorb dirt and oils from usage, so if it looks dirty or grimey; give it a good sanding before you paint. 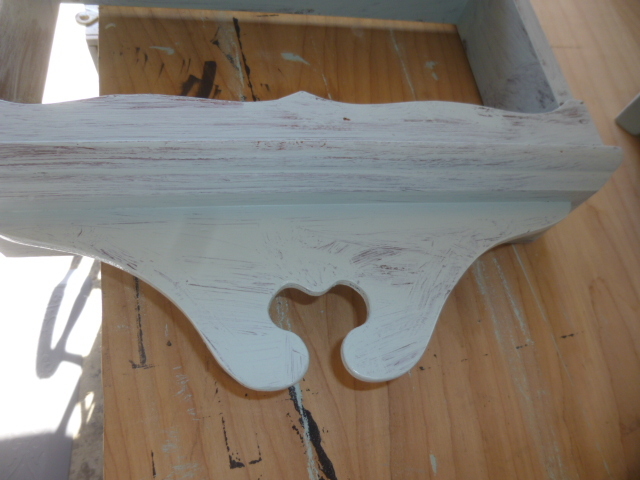 As with the spice rack, I painted the backing separately BEFORE attaching it. 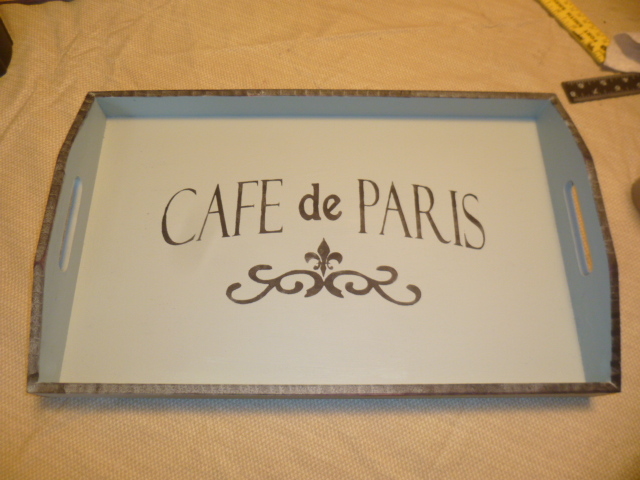 The Cafe do Paris tray was a half-finished project from another time. It had been base coated black, so all I had to do was paint it and stencil the design on. The black ‘edging’ was done with the paint leftover on my stenciling sponge. 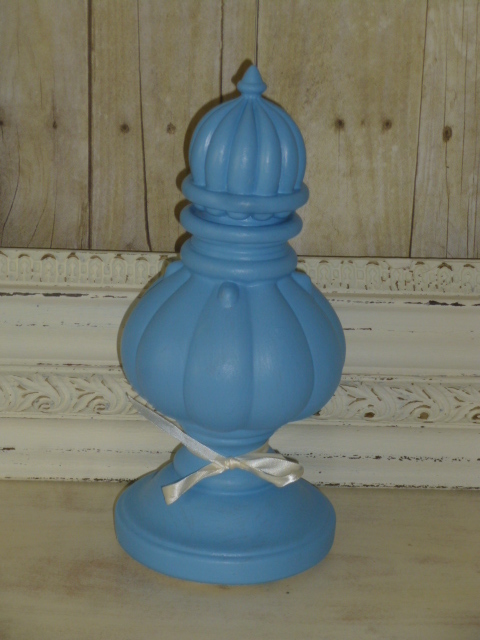 Not entirely sold on the color I used for the upcycled candle holder finial. It’s one of those little free samples that Lowes has coupons for every so often. It’s almost a periwinkle . 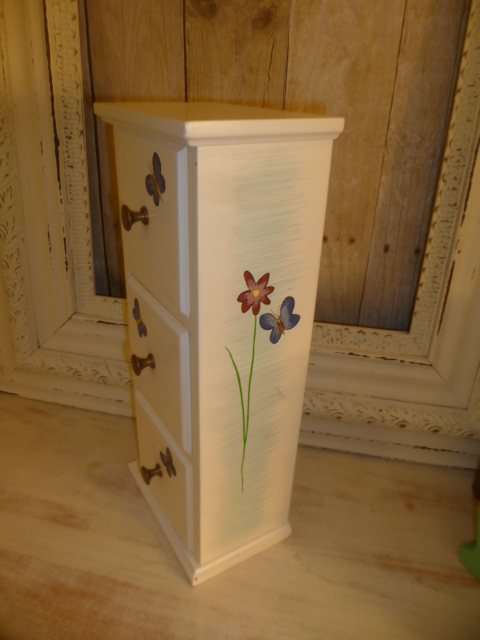 . . we’ll see if it sells, if not I can always repaint it! 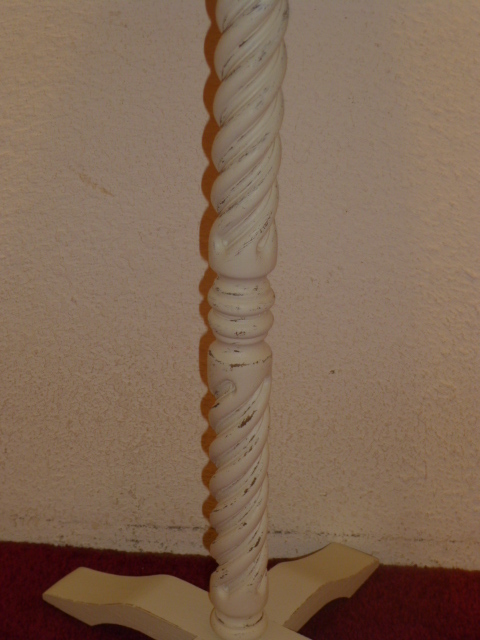 A quick rummaging through my stash of decorative curtain rod ends produced this piece which worked perfectly as a ‘topper’. I just glued it on with tacky glue. 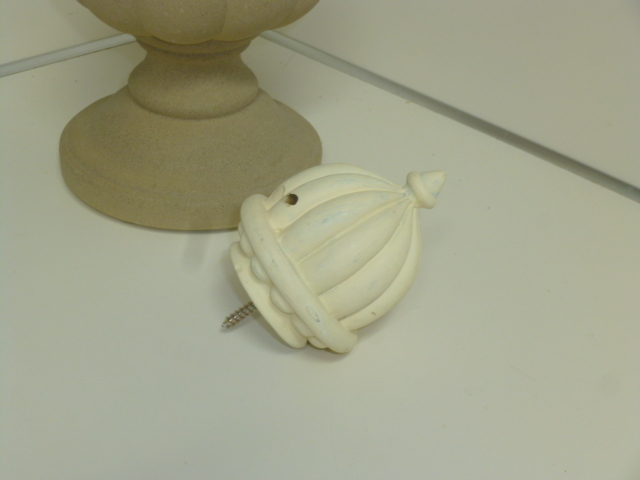 The candle well was deep enough that I didn’t need to remove the screw. 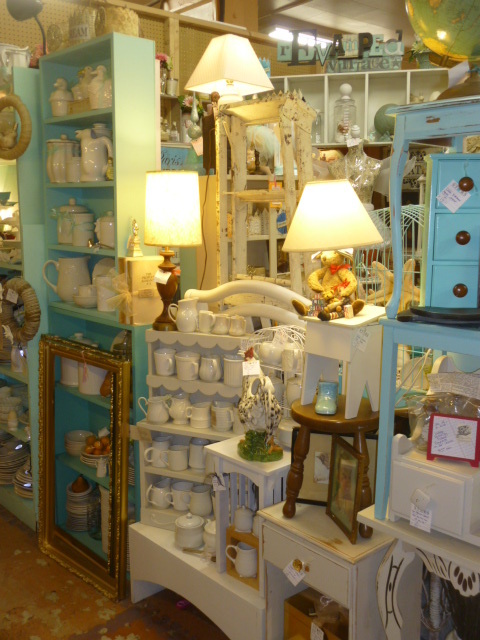 I typically try to put the ‘new stock’ at the front on my booth when I restock. 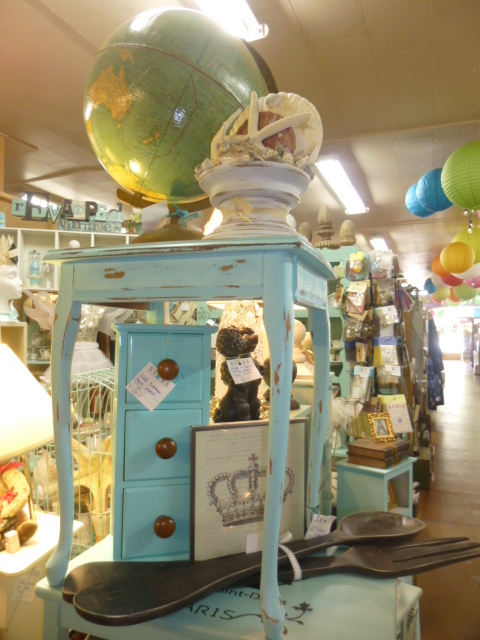 Reason being, most shoppers just ‘glance as they walk by’ as they walk up and down the aisles in the antique mall . . . until something ‘catches their eye’ and draws them in for a closer look. And for those who come in on a regular basis, you want them to see NEW things every time they visit. 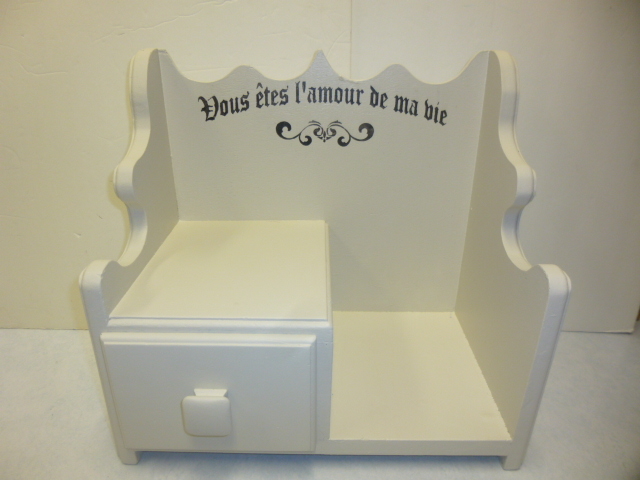 I’ve still got some white and cream color furniture pieces. Some of those are grouped together down the back side of my booth. I tired to ‘gradually’ phase into the new aqua pieces as you move around to the front of the booth. Little gold grouping inside the doll wardrobe. 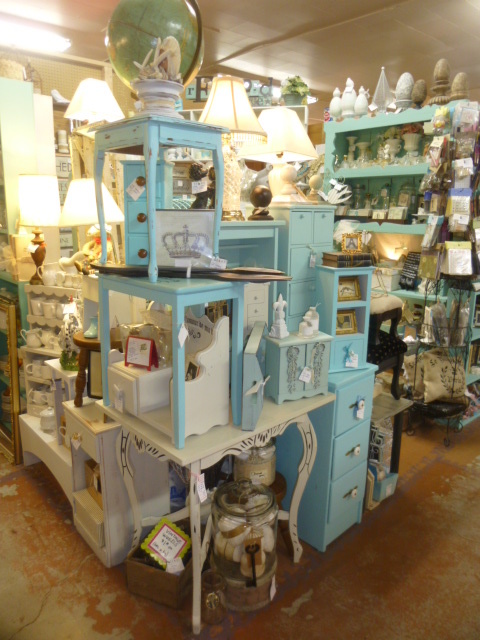 The little 3 drawer piece fit nicely tucked under a small table; the top piece in a stack of three. 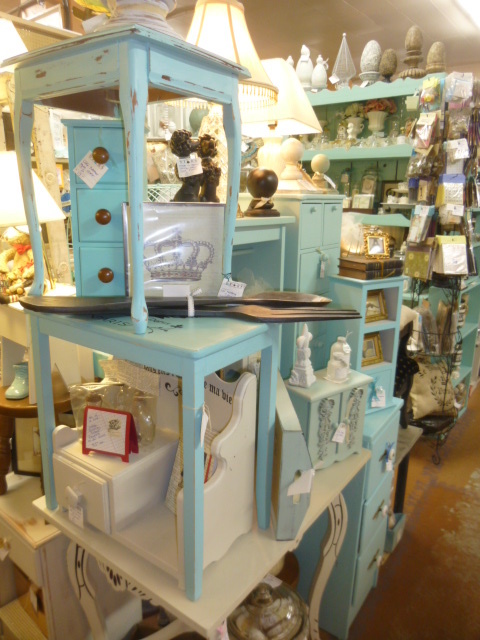 I LOVE this little white shelf with a drawer! I have not idea what it is. My best guess is that it was used in the kitchen for cook books and the drawer for recipe cards. It’s been in my booth for quite a while. Might be time to bring it home and paint it aqua. Layers! I always display in layers! 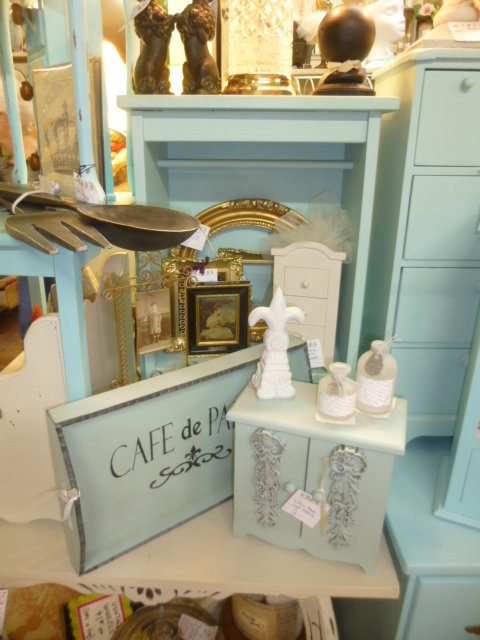 So if the Cafe de Paris sign and little cupboard with doors sells; there is more product behind it so it I don;t have too much bare space. 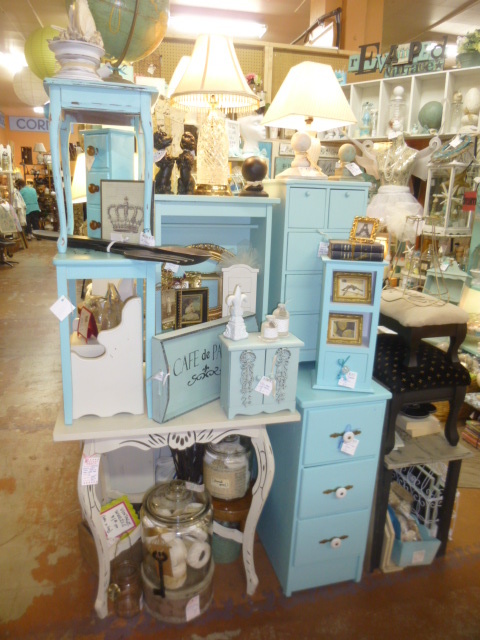 Come on by and check out the new stuff! 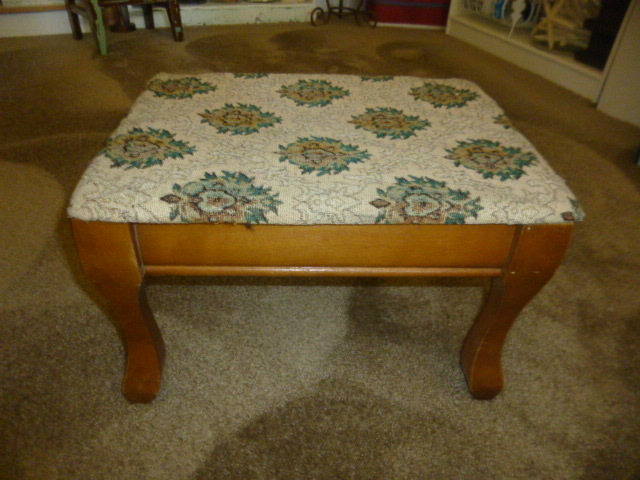 The smaller of the two footstools (the one that had the needlepoint top). 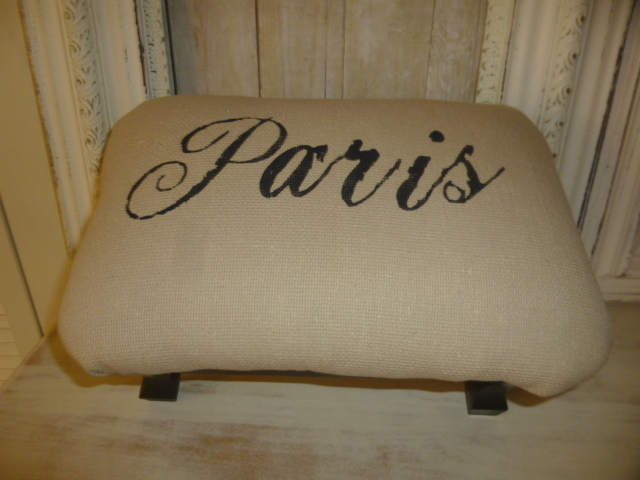 This was my first attempt at stenciling on fabric, and I am pleased to say it worked PERFECTLY! This fabric is kind of a cross between a muslin and burlap. Large, but tight weave with a good amount of ‘body’. (This fabric is actually a scrap piece leftover from a maternity top I made over 33 years ago!) I ironed the fabric and starched it a bit with some spray starch. 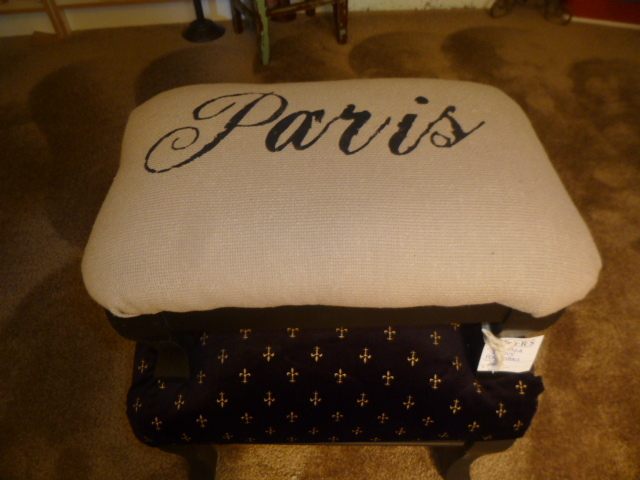 Stenciled the design on the fabric BEFORE attaching the fabric to the stool, just in case I made a ‘boo-boo’. 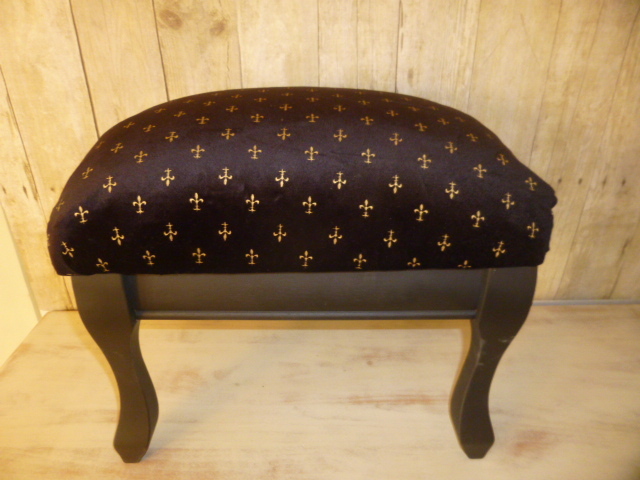 Once dry, I used a staple gun to attach the fabric. The wood frames on both stools was exactly the same (just different sizes) so I decided to make them in coordinated fabrics. 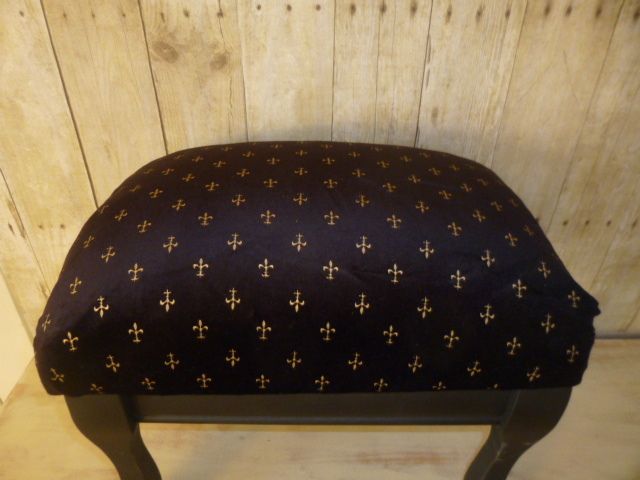 Black velvet with little gold crosses seemed ‘Parisian’ enough to me! I spray painted the legs on both of them with flat black and opted to NOT distress them. 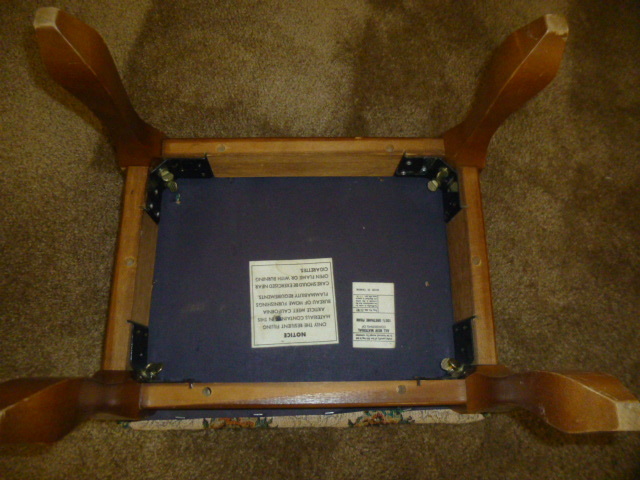 The undersides of upholstered items like this are typically a bit ‘unsightly’. Being one who seems compelled to always looks ‘under and inside’ everything, I try to make those parts ‘pleasing to the eye’ as well. On this one I cut the fabric long enough to completely cover the underside. Much better than seeing THIS, don’t you think? The finished pair; priced separately. I’m quite content with how they both turned out. 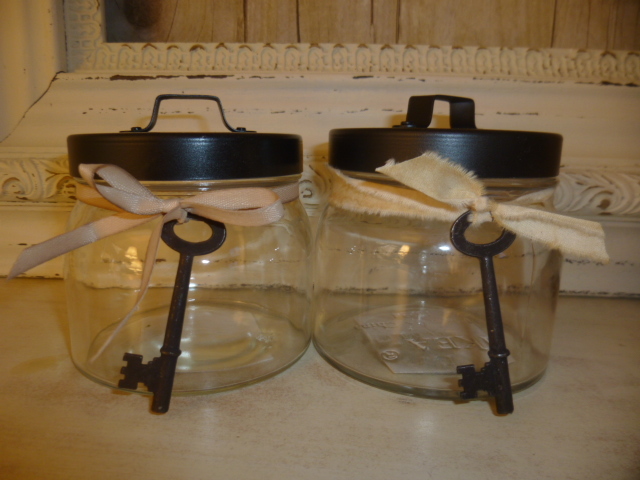 On to the two little jars. First I spray painted the lids with flat black, then a quick clear satin spray to protect the paint since the lids will be handled a lot. 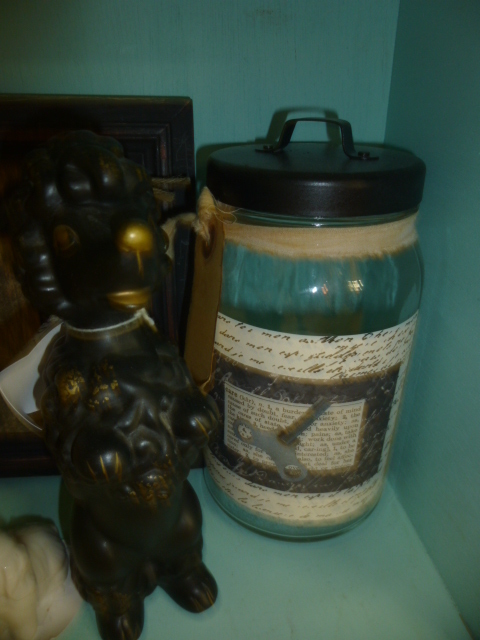 These are the smallest of this type of jar that I’ve ever found. Not really much room to add a label of any kind, so I went ‘quick and simple’. 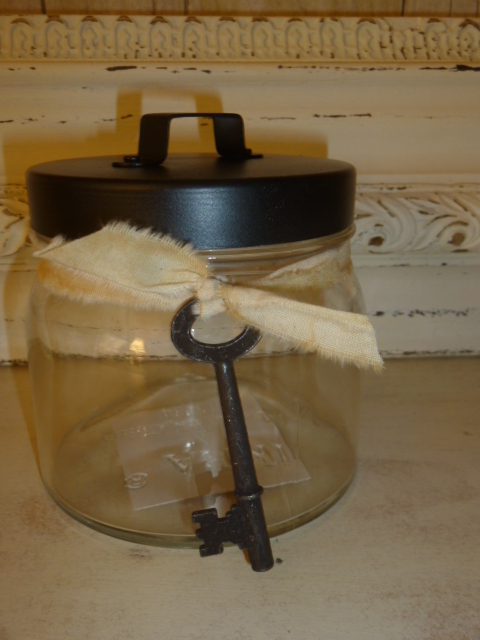 A piece of tea stained ribbon and a repro skeleton key. I always keep a stash of tea stained muslin strips on hand. Which reminds me that I need to make a new batch SOON, as they dry so much better in the hot sun. 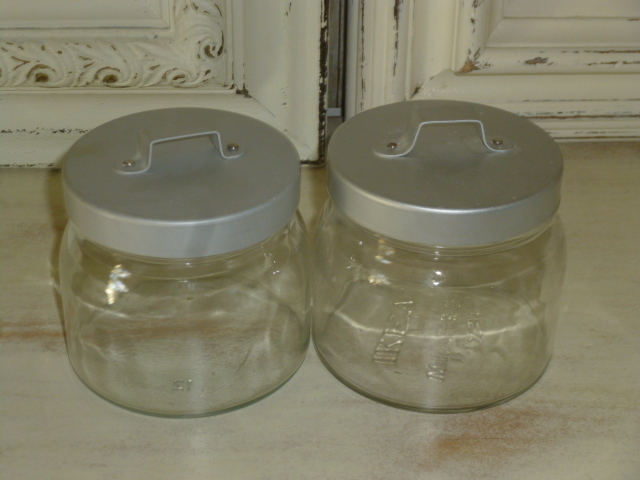 You can see some of the other larger jars with the same kind of ‘lids with handles’ that are currently stocked in my booth at Stars. I’ll just tuck the newest smaller ones in amongst these. 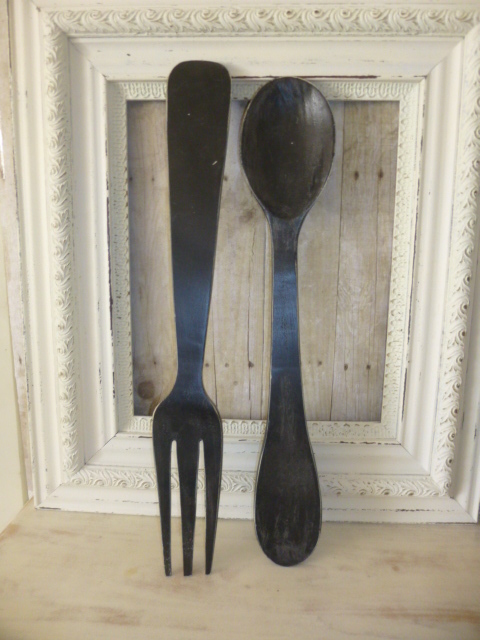 I actually did this giant carved wood fork and spoon a while ago, and set them aside. Now that I have some other black items to take in, I’ll take them also. 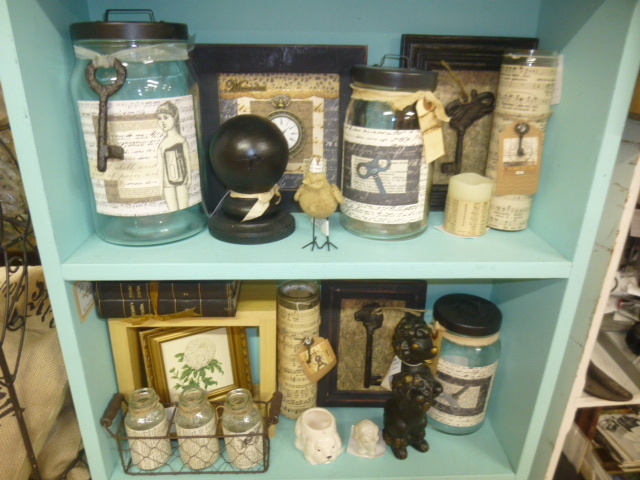 Items typically sell better when displayed with similarly themed items. I actually found this piece at Stars! It was cheap because the top was nearly split in half. 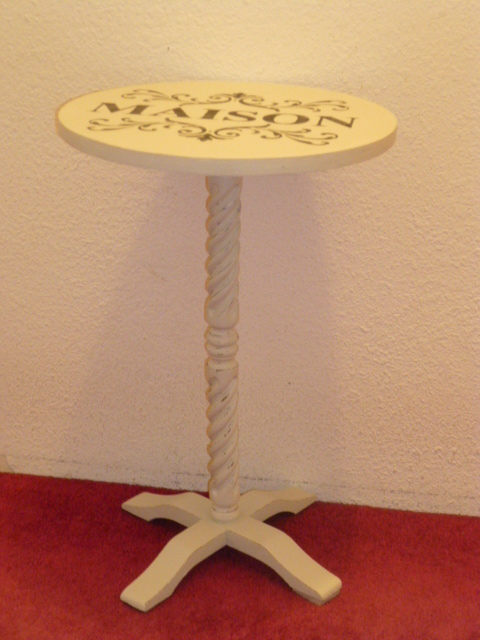 That’s easy enough to replace and I really liked the turning on the pedestal base. Michael found the perfect size round piece in his scrap stash and attached it for me. 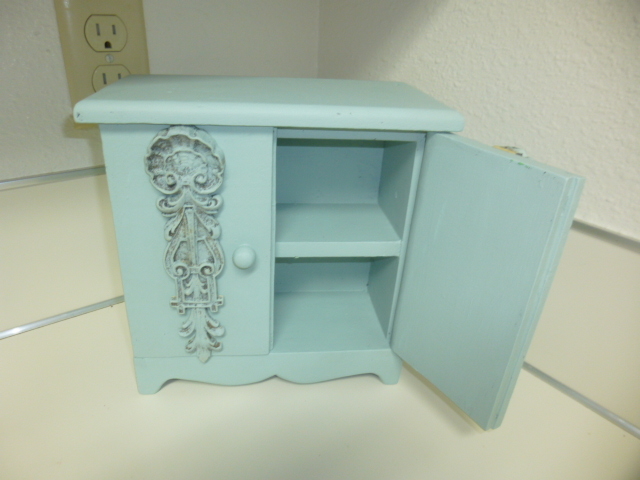 I painted the whole thing my ‘new favorite’ putty color white paint and distressed the base to bring out the pretty turnings. Added a painted on stencil design to the top. Quick and easy! Now available for purchase in my booth at Stars. What IS this thing???? I seriously do not know. 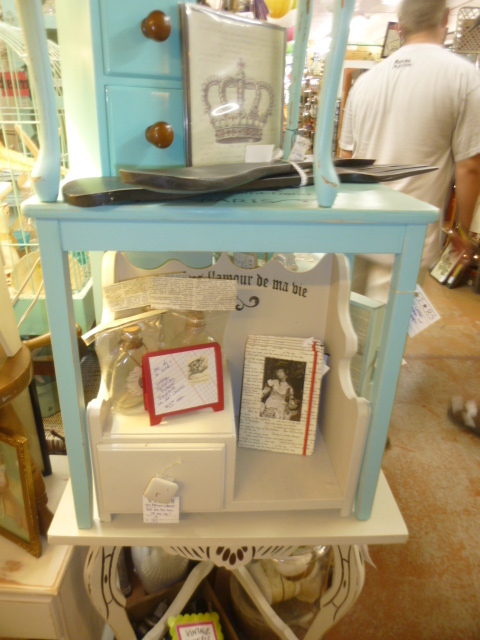 But I love things with little drawers, and the price was right, so into my shopping cart it went. If I HAD to guess what it was, and considering the size of the drawer; I’d guess that it was for storing cookbooks on the shelf part and recipe cards in the drawer. Do people even use recipe cards anymore? Or does everyone had a tablet or notebook in the kitchen to look it up on-line?!? I liked the way the sides and back were detailed too. I’ve been on a bit of a ‘white binge’ lately, so I painted it white. And off to my booth at Stars it went!